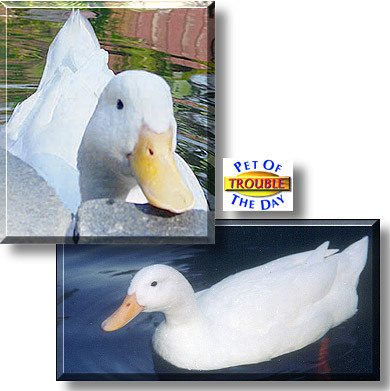 Trouble is a wonderful, full-of-fun pet, and he certainly lives up to his name. He almost died twice as a duckling, he was always getting into trouble. In fact, we were painting the deck yesterday and Trouble got his beak in the paint. He's an active guy, always talking and looking for attention. His bubbly personality brings smiles to friends around the world. Some of his most loyal friends have gotten in trouble for "ducking" their responsibilities at work and watching him on the Duck Cam. Trouble has the typical "in your face" Pekin personality. He loves attention and is a constant source of entertainment. Trouble, along with his inseparable mate Mischief, plus eighteen Red-eared Sliders and Soft Shell turtles can be seen anytime on the Duck Cam. Trouble "rushes" the camera so it's hard to get good shots of him without a decoy - someone with food to distract him.